“Inspired by the millions of trusted traveler reviews and opinions on TripAdvisor.com, the Travelers’ Choice awards have once again highlighted the finest hotels in the world,” said Christine Petersen, Chief Marketing Officer for TripAdvisor. Hacienda Tres Rios, the eco friendly and luxurious resort in the Riviera Maya was awarded a Traveler’s Choice Award 2010 by the well-known travelers website. 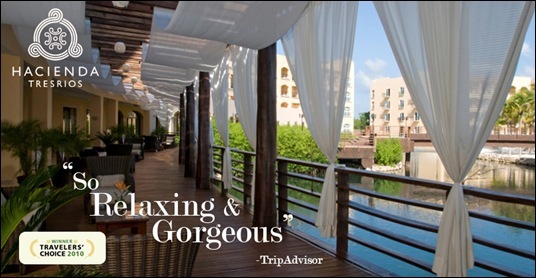 Hacienda Tres Rios Resort is considered one of the Best Relaxation/Spa Hotels in the Caribbean and Mexico by many customers’ reviews on TripAdvisor website. Today, TripAdvisor Media has the largest travel community with over 36 million monthly visitors and about 15 million registered members. Yucatan Holidays and Hacienda Tres Rios are committed to all of our guests, and we are very proud to receive such an important award, because our guests and visitors are the ones giving us such positive reviews and voting on our resort, staff, and services. People may have different reasons for having a vacation; wanting to escape from a traumatic experience through a new environment, a break from work, or simply to enjoy. Whatever the reason is, one of the best destinations is the United Kingdom.